FRF Announces 2018 Law Enforcement Officer of the Year Award Winner - Officer Rebecca Rivera of Ordlando P.D. TALLAHASSEE, FL – The Florida Retail Federation (FRF), the state’s premier trade association representing retailers for more than 80 years, announced the winners of its annual law enforcement officer of the year awards. Detective Rebecca Rivera of the City of Orlando Police Department was selected as the 2018 Florida Retail Federation Law Enforcement Officer of the Year (LEOY). Selected as the Runners-Up were FDLE Special Agent Tatiana Miguel and United States Secret Service Agent Logan Workman. All were recognized, in part, for their work in preventing organized retail crime, and were honored at a prestigious law enforcement awards dinner held earlier this week. Officer Rivera received a cash award, a number of gift cards from FRF member retailers and a custom-crafted medallion and plaque, in addition to her name being added to an official plaque that lists each LEOY recipient since the program’s inception in 1974. Officer Rebecca Rivera is an 8-year veteran of the Orlando Police Department. In her time on the I-Drive bike squad, Officer Rivera has been instrumental in the squad’s proactive enforcement of retail and economic crime. She is recognized by her peers for her performance, initiative, and dedication to her work. Officer Rivera’s diligence, keen skills, investigative tenacity, and use of surveillance resulted in a significant increase in retail theft arrests. Officer Rivera routinely goes above and beyond the call of duty to assist International Drive businesses in crime prevention, investigation, and the apprehension of criminals. Special Agent Miguel is a 15-year veteran of the Florida Department of Law Enforcement, and has been serving the State of Florida for 32 years. She is currently assigned to the Miami Regional Operations Center. Her past assignments with FDLE included economic crimes, internet crimes against children, domestic security, and public integrity. Special Agent Miguel has also served as an Organized Crime Intelligence Agent for the Palm Beach/ Broward/ Miami-Dade region. Special Agent Miguel along with Special Agent Logan Workman were honored together for their work on "Operation Benefactor.” Together, their efforts led to the arrests of 14 individuals in a case with a financial impact of $2.5 million with ties to ongoing federal investigations totaling in excess of $20 million. Special Agent Workman is a 3-year veteran of the United States Secret Service assigned to the Miami Field Office and has been instrumental in a number of significant fraud investigations affecting retailers leading to numerous federal arrests and convictions. The Florida Retail Federation Law Enforcement Officer of the Year program has been an annual event since its inception in 1974. The purpose of the program is to support and encourage outstanding law enforcement work throughout the state, and to recognize the important contributions made by Florida's law enforcement professionals, particularly as it relates to the retail industry. The program’s time-tested campaign theme, "Often taken for granted, they never stop serving ...because they care," remains as relevant today as when the LEOY was first introduced. TALLAHASSEE, FL – The Florida Retail Federation (FRF) today announced that one its board members Lisa Mergel, owner of Kanvas Beauty in Tallahassee, was named the 2018 America’s Retail Champion of the Year in a ceremony held last night in Washington D.C. Mergel was chosen from a group of finalists and received the prestigious award in front of hundreds during an event hosted by FRF’s national partners at the National Retail Federation. Mergel is the owner of Kanvas Beauty, a boutique day spa and beauty products store in Tallahassee that she opened in 2007. The business has ten employees and offers an internship program for Florida State University students studying retail business and merchandising. Mergel, who was recognized as FRF’s Florida Retailer of the Year in 2016 and is a member of the organization’s Beauty Industry Council, was selected from a group of five finalists who included Sean Brownlee of Ravenox, a rope manufacturer and retailer in Burlington, N.C.; Tom Largay of Old Port Cards in Portland, Maine; Nicole Panettieri of The Brass Owl boutique in New York City; and Linda Taylor of VK Electronics in McCook, Neb. Mergel, a career-long retailer, began her career working for major retail brands in New York before moving to Florida and opening Kanvas which is a unique concept of a world class day spa and specialty boutique. Outside of work, Lisa volunteers her time at one of many local civic organizations and mentoring retail merchandising students from Florida State University. The America’s Retail Champions program, now in its fifth year, honors retailers who make their mark on public policy debates affecting the industry. 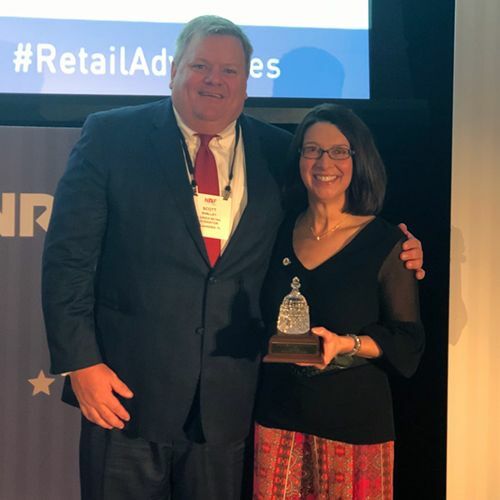 Over 40 retailers from across the nation ranging from online sellers to small and mid-size store owners were nominated by state retail associations and their peers based on engagement in public policy discussions at the local, state and national level. Participants will meet with members of the House and Senate on Capitol Hill today to discuss the retail industry’s public policy agenda and priorities. (TALLAHASSEE) - Detective Scott Frantz is a highly motivated law enforcement officer committed to professional excellence. In addition to carrying a full case load in the Daytona Beach Police Department's Criminal Investigations Division, he is the lead officer for all of the department's organized retail crime cases. Over the past year Detective Frantz has dismantled an organization that was responsible for more than three million dollars in theft and losses to several retail stores in and around Daytona Beach. His diligence and contributions to the retail industry helped him earn the prestigious distinction of being named the 2011 Florida Retail Federation (FRF) Law Enforcement Officer of the Year (LEOY). Detective Frantz received a check for $3,000 and an attractive custom-crafted medallion and plaque when he was honored at FRF's annual awards banquet on Tuesday, October 11, 2011, at the Omni Orlando Resort at ChampionsGate in Orlando, Florida. His name has been added to a plaque that lists each LEOY recipient since the program's inception in 1974. Detective Sgt. Michael Griffin, who nominated Detective Frantz, accept the plaque on behalf of the Daytona Beach Police Department, where it can be displayed for the next year. Dennis Wamsley, director of loss prevention for Publix Super Markets, Inc., and chairman of FRF's LEOY committee, made the presentations on behalf of FRF's nearly 9,000 member companies. A contribution was also made by FRF to the Fraternal Order of Police Memorial Foundation on behalf of the Daytona Beach Police Department. The Foundation maintains a permanent memorial and sponsors a memorial service each year in the state's capitol to commemorate Florida's law enforcement officers killed in the line of duty. Investigator Robert Rohrbacher of the Tallahassee Police Department was selected as the Runner-Up. He was also honored at the October 11th event. Two officers receiving Honorable Mentions will be honored locally. They are: Officer Steven Negron of the Sunrise Police Department and Special Agent Eric Jester of the Florida Department of Law Enforcement. All officers recognized were selected from a field of outstanding nominees that represent various law enforcement entities from throughout the state. "The Florida Retail Federation is proud to continue its 38-year tradition of recognizing Florida's finest law enforcement professionals. Each of these officers contributes significantly to the retail community as well as to Florida's citizens as a whole," says Richard A. McAllister, FRF president and chief executive officer. "All of the nominees are very deserving and we are extremely grateful for their efforts." Detective Frantz is committed to making a difference in organized retail crimes and spends hours of his own time forging relationships with Daytona Beach area retailers in these efforts. During one such case this past year, Detective Frantz and his team used a variety of investigation techniques to acquire lists of items that three stores in Daytona Beach wanted stolen from other stores. These stores would then purchase the stolen items for resale. Nine separate sales and purchases were made at these stores by law enforcement. Following a three month investigation, all three stores were seized and search warrants executed. This resulted in the confiscation of more than $40,000 in cash, more than $10,000 of stolen items, the closure of the three stores, and the arrest of their owners. Ultimately, a million dollar organized retail crime ring with three fences and ten professional shoplifters, or "boosters," all acting in concert with each other, were shut down. Detective Frantz, working cooperatively with retailers, had several other successes in disrupting these theft rings. Stolen products have ranged from health and beauty items to over-the-counter weight loss supplements and cigarettes. "Organized theft currently cost retailers some $34 billion annually," says McAllister. "Detective Frantz's continued actions, as well as those of our other honorees, illustrate the success that can ensue when law enforcement and retailers work together to combat crime." Detective Frantz began his law enforcement career in the United States Army, serving as a military police officer for three years. He has worked for the Daytona Beach Police Department for 19 years. Detective Frantz joins 41 previous LEOY recipients who represent various branches of law enforcement including police departments and sheriff's offices, the Florida Department of Law Enforcement, the Florida Highway Patrol, and the former Florida Marine Patrol. Investigator Robert Rohrbacher works in the Financial Crimes division of the Tallahassee Police Department. His focus includes cases such as identify theft, check and credit card fraud, and cyber crimes. His constant vigilance, exceptional collaborative efforts, and astute observation led to him break a substantial theft ring this year. In January 2011, Investigator Rohrbacher was eating lunch at a local restaurant when he noticed a customer with an out-of-state drivers' license purchasing gift cards with a credit card. Suspicious of possible credit card fraud, he then observed the suspect and his accomplices repeat the process at several other restaurants. Investigator Rohrbacher than quickly organized a rolling surveillance operation. Investigation revealed that all three suspects possessed fraudulently created debit / credit cards in which the subjects' names were embossed, but the cards had been re-encoded with victims' stolen credit card information. This trio was arrested and substantial evidence seized. Further investigation revealed that one of the suspects was the leader of a group committing credit and debit card fraud across the southeastern United States. This group was responsible for purchasing approximately 16,500 merchant gift cards valued at more than $1.4 million through using stolen accounts. The cards were being sold to online resellers. Investigator Rohrbacher has worked for the Tallahassee Police Department for 16 years. He was nominated by Sgt. Elizabeth Dillon of the Tallahassee Police Department. The Florida Retail Federation Law Enforcement Officer of the Year program has been an annual event since its inception in 1974. The purpose of the program is to support and encourage outstanding law enforcement work throughout the state, and to recognize the important contributions made by Florida's law enforcement professionals, particularly as it relates to the state's retail industry. The program's time-tested campaign theme, "Often taken for granted, they never stop serving ...because they care," remains as relevant today as when LEOY was first introduced. The Florida Retail Federation is a statewide trade association that represents Florida's most important industry – retailing – and has served as "The Voice of Florida Retailing" since its inception in 1937. Florida retailers provide one out of every four jobs in the state, and collect and remit approximately $22 billion in sales and retail-related taxes for Florida's government each year. Orlando, FL – Norman Love, owner of Norman Love Confections, Fort Myers; Laurie Olshefski, owner of Shimmering Seas Jewelry & Gifts, Panama City Beach; and Jesse White, owner of Sarasota Architectural Salvage, Sarasota, have been named by the Florida Retail Federation (FRF) as the 2011 recipients of the prestigious Retailer of the Year Award. They received their awards at a luncheon held in conjunction with the University of Florida's nationally acclaimed Retail Smarter symposium on Thursday, June 23, 2011, at the Caribe Royale in Orlando, Florida. Dan Doyle, FRF chairman of the board, who is senior vice president of Beall's, Inc., Bradenton, made the presentations. "We are excited to honor these inspiring, creative entrepreneurs who have turned their passions into successful business ventures," says Richard McAllister, FRF president and CEO. "Mr. Love, Ms. Olshefski, and Mr. White embody the spirit of outstanding retailing through their dedication to their customers and employees, plus their commitment to the communities they serve"
Norman Love has a passion for chocolate – artistically designed, lusciously delicious, handcrafted chocolates. This passion led him to launch Norman Love Confections in Fort Myers in 2001. Using the finest ingredients from throughout the world to create his unique line of ultra-premium masterpieces, Norman has grown his company to be recognized worldwide. With their artistic designs, rich rainbow colors including reds, oranges, and purples, and unique flavors such as Tahitian caramel, key lime and passion fruit, each box of Norman Love Chocolates packs a "wow" factor. Among Norman Love Confections' numerous accolades is being named the top chocolate in the United States by Consumer Reports this year. Norman was honored as one of the "Top 10 Chocolatiers in North America in 2009 by Dessert Magazine, is co-founder of the National Pastry Team Championship, and is a regular guest judge on the Food Network Challenge series. Norman prepared for his current success by studying pastry-making in France and serving as the executive pastry chef for many years at various luxury resorts. As corporate executive pastry chef for The Ritz-Carlton, he oversaw global pastry and bakery operations, opening 30 hotel and resort pastry kitchens in international and domestic locales including Boston, Dubai and Bali. In his own business, Norman instills a corporate culture of relentless pursuit of innovation, excellence and quality. He empowers his employees and creates a positive atmosphere conducive to their success. He is dedicated to giving back to the community, with the company donating to more than 300 nonprofit organizations each year. Complementing his original Fort Myers location, Norman recently opened a Chocolate Salon in Naples, setting the stage for further expansion. Norman was nominated by Mr. Gary Baker, owner of Professional Insurance Services, Inc., Cape Coral. Laurie Olshefski knew she wanted to be the CEO of a corporation from the time she was teenager. She has successfully realized that goal through LAMO Inc., and realized success as a retailer. Laurie, who has been in retailing for 17 years, currently owns and operates four stores. They are: the Fitness Fetish Family Sport and Beach Shoppe (www.fitnessfetish.com), Seaside, established in 1994; Shimmering Seas Jewelry and Gifts, founded in Seaside in 2002, with a second location added in Panama City Beach in 2008; and Jake at the Beach Life is Good Genuine Neighborhood Shoppe in Panama City Beach (www.jakeatthebeach.com), opened in 2008. Laurie, along with her husband, John, have created welcoming, fun stores offering unique items at affordable price points. Customers are made to feel special with exceptional service, parties, open houses, and designer trunk shows, among other benefits. Employees enjoy bonuses for working out regularly, continuing education and training support, birthday bucks and incentives in a caring, family atmosphere. Laurie is an active, positive community leader. She donates time, through her church, to the Anchorage Children's Home and the Autism Education Center in Panama City. A certified yoga instructor, Laurie is an advocate for promoting a healthy body, mind and spirit. She donates yoga instructions to raise funds that support children and women in need, plus donates her time to teach interactive yoga classes to elementary age children at schools and churches. In addition, her stores support numerous local fundraising efforts as well as contribute to charities that include St. Jude's Hospital, the Panama City Rescue Mission, Susan G. Komen, Bright Point for Children, and the Shriners. Laurie was nominated by Ms. Beth Oltman, president and CEO of the Panama City Beach Chamber of Commerce. Jesse White founded Sarasota Architectural Salvage (SAS) in 2003 with a vision of building a business that served an environmental mission and helped people see the value in reusing and recycling. Blending expertise gained as the owner of an independent consulting firm offering recycling solutions to government entities with his penchant for the environment, antiques and architectural elements, Jesse has guided SAS into a resounding success. Since opening eight years ago, Jesse has been able to triple SAS's current selling space and offerings. He and his employees find a steady supply of rotating stock by locating buildings slated for remodeling or demolition, and then removing anything and everything of value. They work cooperatively with historical societies and preservation groups. The result is an eclectic mix of architectural antiques and furniture, décor, garden art and building materials. Items range from door knobs to chandeliers and are sourced both domestically and internationally. The company also offers custom wood and iron furniture fabricated from salvaged materials. Ultimately, SAS is a popular draw for the general public as well as the interior design community. Jesse shows appreciation to his long-term, loyal staff through providing such benefits as flexible schedules and insurance benefits, and recognizing them with random acts of kindness. His customers are treated to Saturday morning coffee and sweets during the winter, and summer holiday cookouts. Jesse notes that SAS has built their success hand in hand with the community. He promotes a "Buy Local" message, among other campaigns, to help advance all of his area's businesses. Each year the company directs thousands of dollars to non-profit organizations, accepts consignments on behalf of local non-profits, and provides numerous in-kind donations.